Welcome to the website of the Friendly Band (Sowerby Bridge). We have been based in the Village of Friendly since 1868 and are proud of our history. The band is totally self supporting, having no sponsors, and works hard all year round, performing not only locally but throughout Yorkshire. We are available for any occasion, Weddings, Birthdays, Concerts, Corporate Hospitality etc. A full Band or Ensemble can be hired to suit your needs. We are always seeking new brass players to compliment and improve our line up (as well as help out on occasions) so why not come to one of our practices and enjoy yourself with our social group of players. We rehearse Tuesday and Friday 20:00-22:00 playing many different types of music. We also provide free tuition and free instrument loan to any person, young or old, who wishes to take up the playing of a brass instrument. Free instrument and uniform loan are also provided to players wishing to join the Band. The Bandroom is in a prime location in the heart of Friendly Village, and we encourage any Organisation, Group or Individuals who wish to utilise the Building as a meeting place or hold a function within, to contact the Secretary expressing their interest. We wish to ensure the whole community can benefit from this work and maximise the use of the Bandroom as a Community Meeting place. 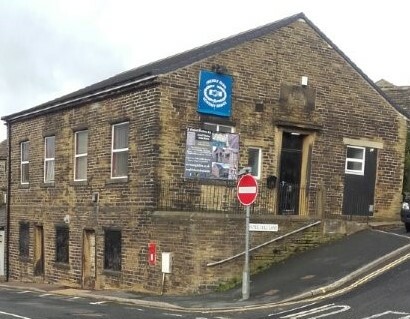 The building benefits from 2 floors, the upper being the Bandroom (which can be cleared if necessary), comprising of a large room, seperate kitchen area and ladies and gents toilet facilities. The lower level floor has a smaller main room but again has a seperate kitchen and ladies and gents toilet facilities. We are pleased to announce that the Charity Commission have granted The Friendly Band Charity Status. This will allow us to maximise all donations by the use of Gift Aid. Please contact the Secretary if you require a Gift Aid Form. Contact us enquiries@friendlyband.org or telephone the Secretary, Jayne Lawrance 07707697778 for all your enquiries. We are proud to present The world famous Trumpet Soloist, Mr Anthony Thompson, in concert with the Friendly Band, April 6th 2019, at Warley St Johns Church commencing 7:30pm. For a larger poster please see the Events Tab of this website. Saturday 2nd March found Friendlyband at the Yorkshire Regional Championships held at Huddersfield Town Hall. We put in an extremely satisfying performance, whilst only finishing 6th it gives us a great platform to build on. You can listen to our performance on the link below - enjoy.